This description of the Book of Judges is from Easton's Bible Study. "Judges, Book of: is so called because it contains the history of the deliverance and government of Israel by the men who bore the title of the "judges." The book of Ruth originally formed part of this book, but about A.D. 450 it was separated from it and placed in the Hebrew Scriptures immediately after the Song of Solomon. An introduction (Judges 1:1-3:6), connecting it with the previous narrative in Joshua, as a "link in the chain of books." 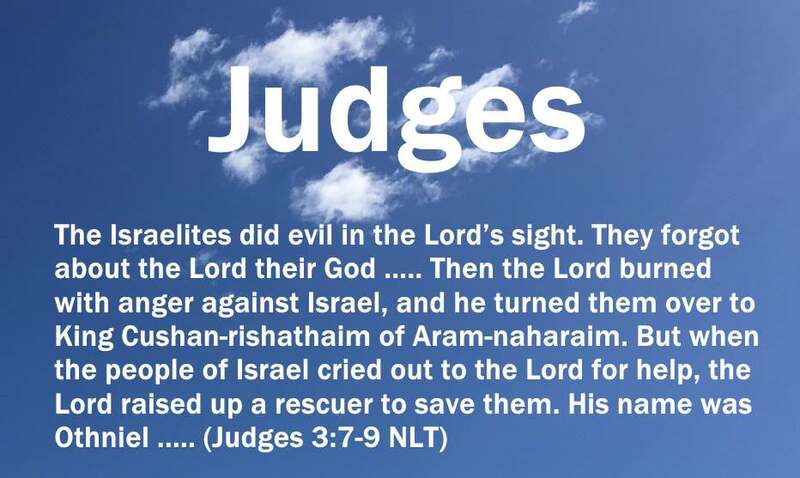 The history of the thirteen judges (Judges 3:7-16:31) in the following order: FIRST PERIOD (Judges 3:7-5:31) (206 years) Servitude under Chushan-rishathaim of Mesopotamia (8 years) OTHNIEL delivers Israel, rest (40 years) Servitude under Eglon of Moab: Ammon, Amalek (18 years) EHUD'S deliverance, rest; SHAMGAR (80 years) Servitude under Jabin of Hazor in Canaan (20 years) DEBORAH and BARAK (40 years) SECOND PERIOD (Judges 6:1-10:5) (95 years) Servitude under Midian, Amalek, and children of the east (7 years) GIDEON (40 years) ABIMELECH, Gideon's son, reigns as king over Israel (3 years) TOLA (23 years) JAIR (22 years) THIRD PERIOD (Judges 10:6-12:15) (49 years) Servitude under Ammonites with the Philistines (18 years) JEPHTHAH (6 years) IBZAN (7 years) ELON (10 years) ABDON (8 years) FOURTH PERIOD (Judges 13-16) (60 years) Servitude under Philistines (40 years) SAMSON (20 years)Total: 410 years Samson's exploits probably synchronize with the period immediately preceding the national repentance and reformation under Samuel (1 Samuel 7:2-6). The historic section of the book is followed by an appendix (Judges 17:1- 21:25), which has no formal connection with that which goes before. It records (a) the conquest (Judges 17:1 - 18:30) of Laish by a portion of the tribe of Dan; and (b) the almost total extinction of the tribe of Benjamin by the other tribes, in consequence of their assisting the men of Gibeah (Judges 19:1 - 21:25). This section properly belongs to the period only a few years after the death of Joshua. It shows the religious and moral degeneracy of the people. The author of the Book of Judges was most probably Samuel. The internal evidence both of the first sixteen chapters and of the appendix warrants this conclusion. It was probably composed during Saul's reign, or at the very beginning of David's. The words in Judges 18:30,31 imply that it was written after the taking of the ark by the Philistines, and after it was set up at Nob (1 Samuel 21:1-25). In David's reign the ark was at Gibeon (1 Chronicles 16:39)"